When I first heard about Bionyx, I didn’t know what to expect. But since I am always excited to try new products, I was enthusiastic about this new brand I just came across. I went to the Bionyx website, and was really impressed with everything. I found their concept to be very exciting. The first thing that struck me was the use of platinum in each skin care product. I have heard of precious metals being used in skin care, so it didn’t come across as a surprise. But it did set the bar high. After all, if you use something like platinum, you need to do justice to the product. I wasn’t sure about what benefits platinum could offer to the skin, so I did some research of my own. Turns out that platinum has natural antioxidant properties which can restore the skin’s balance, and can also help in boosting the skin’s hydration and elasticity. In other words, if you’re looking for anti-aging solutions, you’ve got to check this one out. And using platinum wasn’t the end of it. I also saw that they used ingredients such as DMAE, collagen, vitamin A and palmitoyl tetrapeptide-7 in their products. I have come across most of these ingredients in various skin care brands, and I know that they pack a punch. The products look really pretty in those fancy jars. Just check the picture out. I was particularly impressed by the mask. It heats up when it touches the skin, and this gave me some really pleasing and refreshing sensations. I literally felt like a princess after putting the mask on. After the mask, I applied the redefining serum. I needed just 2 pumps of the product and it was enough to cover up the entire face area. Again, very beautiful, but not sure if it can benefit the skin. Sure, the skin looked smoother, but I wouldn’t come to know until later, would I? Finally, I completed my skin care regimen by applying the Vita Night Recovery. After so much product application, I knew I had to go to sleep, because any evident benefits would only be seen the next morning. The first thing that I did after waking up was to run towards my dressing table. I have a big mirror which lets me examine myself in great details and the image it put in front of my eyes that particular morning was something that I am not likely to forget in a hurry. I could actually see a huge difference in the way my skin looked after a single use of three Bionyx products. The face felt fuller and it also had a radiant glow to it, something that is a rarity in my particular case. This inspired me to keep using the products, and after two weeks of product usage, things are even better. I used the mask two times, and the serum and night cream on a daily basis. I must say that the results have been very consistent. I felt better when I used the mask, but that was expected. Overall, the texture of my skin has visibly improved and I am noticing a slight reduction in my fine lines as well. I am happy to say that Bionyx doesn’t just sit pretty, it delivers on its promises and does what it is expected to do. Using these products made me realize what I was missing all this while, and even though I don’t have serious wrinkling issues as yet, it’s always better to be safe and start off early. 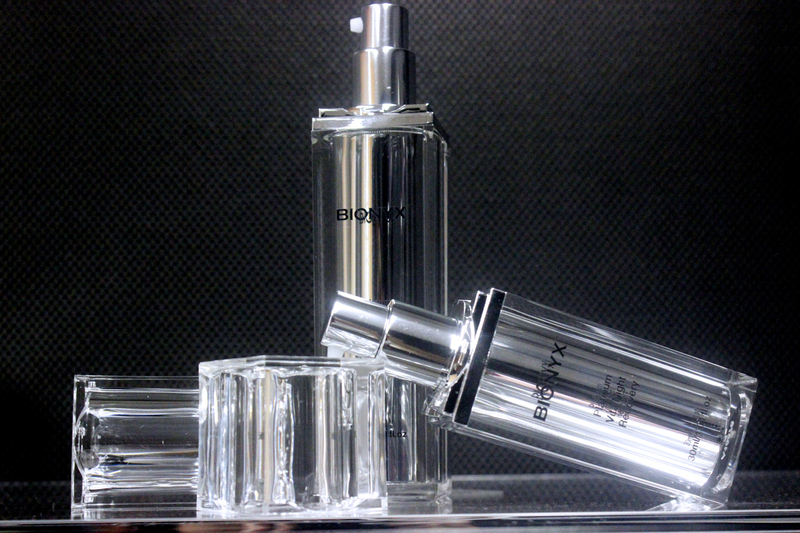 This entry was posted in Skin Care and tagged Bionyx, product review, Review, skincare. Mia Showers is a writer and blogger from Seattle, WA. When she's not writing, you can find her making salmon crepes with her husband, or running with her dogs In Green Lake Park. Amazing! Products that truly work are so worth it and so hard to find! I saw an Instagram post, became curious & looked up reviews…its no wonder all the faces advertising this wonderful product are so beautiful and youthful looking, everyone is absolutely glowing from the inside out due to this product not only making them look amaxing but feel amazing as well! Woukd love to try it! I have not personally used this wonderful product, but after reading so many testimonies on the miracles it performs, it would be aboolute dream to try and see the results it does, having waxed facial hair since the age of 13 “now 32” my skin has some fine lines in those areas. I know it’s that time where wrinkles are to be appearing but to be given the chance to rewind the years would a dream come true! I would say a bit too expensive for me but if it works than those who can afford should definitely buy it. I would love to try it if given the opportunity. This would be the ultimate splurge! I would love to try this product. Good luck to everyone! The product will be a wonderful to have. OOHH WOW ITS RLY PRICEY !! PROBABLY SOMETHING I CAN NEVER AFFORD BUT A GIRL CAN DREAM.. RIGHT? Sounds like a good product!I would love to win and find out. Wow, the products sounds amazing. It’s good to know that these products really do work. Thanks for the review! Great! Just what I need, I’m 72. Wonderful product & information. The other post had more pictures. Couldn’t leave a comment there though for the contest as the site had no option to write a comment. Thank you! I would love to give this product a try! You made it sound so fancy, I have to have it! I didn’t even know these types of products existed but it’s great to know they work especially with that price tag. Could not comment on first post and only 13 comments? Costly but would love to try. Never heard of Bionyx before, but the products sound amazing. I love the packaging, it looks so glamorous. I’d love to try this- the older I get the more seriously I take my skincare! Can’t wait to try it!! I have drawers full of products that just don’t work so this sounds awesome. I’m looking for something that will be appropriate for my aging skin. I’m pushing 40 and I’m ready to change my entire routine. I’ll pay it, although expensive, if it’s worth it. These sound like really great products! I would love to try them! Awesome review! I could never afford this but it would be great if I could win. What ingredient in this product makes it so much more expensive than other products? I would love to live fancy and use this regularly – but it’s not in my price range right now. Someday I’ll become an exotic millionaire and use only the finest creams and oils – like this beauty. I just puchased a package and only tried it one time. It is the Platinum in it. Hoping to win. Great prize! This sounds like something that would help my dull looking skin. This product sounds so fantastic! I could really use this! Compelling review. These products sound wonderful, and quite remarkable. Bionyx products look like they’re in the space age! Also researching about it is very intriguing, really ready to give it a try! Sooo crazy expensive but I’d love to try it to see if I noticed a difference in my skin! I tried to comment on your other article but comments were closed. I love great skincare and this sounds really nice! Loved your honest review. I would pay this much for these skin care products if I could! I also tried to comment on your other post for your giveaway but the comments were also closed for me. I cannot even imagine what it must feel like to use such expensive and exquisite skin care products. Comments closed/no place to post on the — is $2000 platinum skin care worth —- to me NO. The product sound wonderful but there is just no way the average/above average budget could afford this. This would be amazing to try. I look for products with the best hydration! Wow, this would be the ultimate luxury skin care. This sounds so nice. I would love to try it.